Dickinson is a city in Stark County, North Dakota, United States. 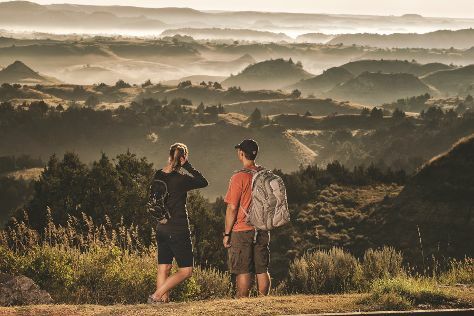 Change things up with these side-trips from Dickinson: Assumption Abbey (in Richardton), Enchanted Highway (in Regent), Theodore Roosevelt National Park (South Unit, Peaceful Valley, & more), Medora (Theodore Roosevelt National Park, Little Missouri National Grassland, & more) and Pioneer Trails Regional Museum (in Bowman). And it doesn't end there: examine the collection at Dickinson Museum Center, tee off at Heart River Golf Course, get to know the fascinating history of Patterson Lake Recreational Area, and get lost in a book at Theodore Roosevelt Center at Dickinson State University. To get more things to do, maps, reviews and other tourist information, read our Dickinson travel guide. Use the Route module to find travel options from your starting location to Dickinson. In June in Dickinson, expect temperatures between 74°F during the day, and 50°F at night.